Havant & Waterlooville FC has beaten hundreds of nominated businesses to be named as the overall winner at Alan Mak’s third Havant Small Business Awards, hosted at Havant & South Downs College. The Hawks have enjoyed success on and off the pitch in recent years, achieving back-to-back promotions to reach the highest level of the non-league pyramid and growing a thriving commercial business with the Westleigh pub, which won the Best Pub Award. The football club is also well known for its work in the Leigh Park area through the ‘Hawks in the Community’ programme, providing outreach and sporting activities for young people. 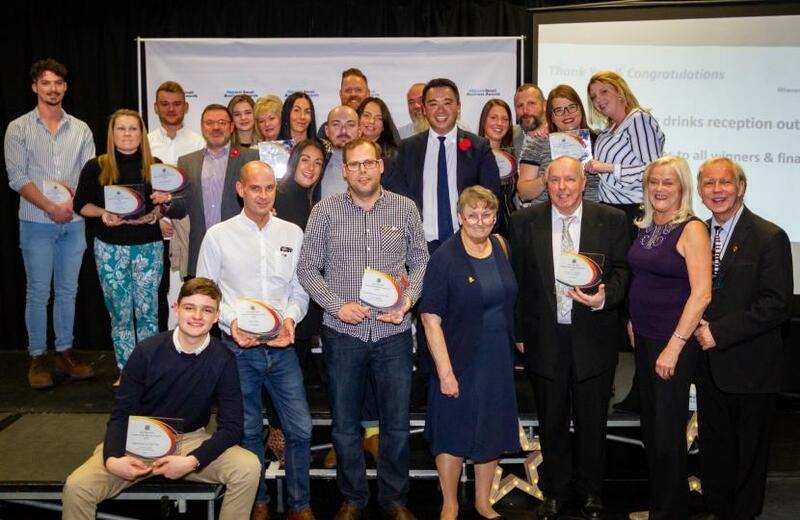 Businesses from across the Havant constituency were recognised at the awards ceremony, with winners announced in 12 separate categories from Best Café, Takeaway and Pub to Best Family Business, Apprentice and Business Personality. It comes after Havant MP Alan Mak received a record number of nominations from the public with more than 500 local business put forward by residents. He said: “Backing our local businesses and the hardworking local people behind them is a top priority for me. My awards celebrated some of the best businesses from across the Havant constituency for a third year. The guest speaker on the night was Nic Yeeles, co-founder and CEO of Peg, a disruptive digital start-up that works social media influencers. He spoke about some of the challenges and experiences he’s faced since founding his first business aged 18. Aside from the awards, a charity raffle helped to raise more than £500 for both the Southern Domestic Abuse Service and the Royal British Legion, two causes Alan has supported since he was first elected to Parliament.